Picnic spot as well as a holy spot. Kodagu (Coorg) district has been famous for natural beauty and tourist attractions. India's largest Tibetan settlement, it boasts Omkareshwrara temple, Madikeri fort, Namdroling Monastery and the Nagarhole National park. And Irupu (Eeerpoo) falls, another well known land mark of the district, lies at the base of the Brahmagiri Range near Nagarhole National Park in South - West Karnataka. Emerging from the lush Western Ghats, it is an ideal picnic destination for visitors who looking to get away from the hustle and bustle of city life. The waters of Irupu originate from streams in the Brahamagiri range and jumps down the ravine in two tiers from a height of 60 metre. It is also known as the Lakshmana Tirtha Falls derived from the name of the tributary of Cauvery River, which starts from these falls, the Lakshmana Tirtha River. According to a legend, Lord Rama and his brother Lakshmana (heroes of the epic Ramayana) passed along the Bhramagiri range in search of Sita. When lord Rama asked his brother to get some drinking water, Lakshmana shot an arrow at the Brahmagiri hills which started spurting water. This stream of water came to known as the Lakshmana Tirtha River and on Mahashivratri day lots of devotees take a holy dip in the river to wash off their sins. 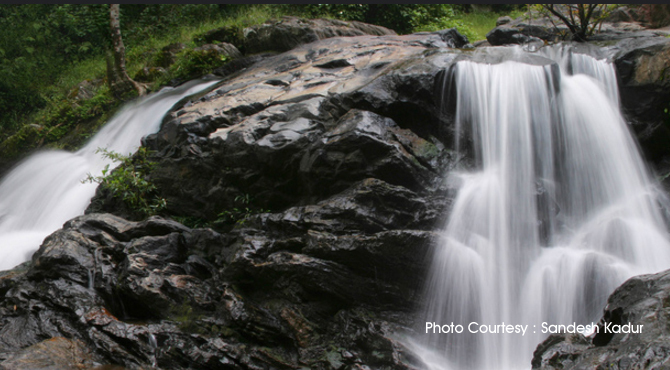 It's easy access and beauty makes it a favorite tourist destination in Coorg. The Irupu Sri Rameshwara temple near the Irupu waterfall attracts Hindu pilgrims, especially during the Shivaratri festival in February. It is said that lord Rama himself installed the Shivalingam inside the temple. Nearby, there is another temple dedicated to Lord Ram, surrounded by paddy fields, from where it is ascend to these falls. Vehicles can reach the base of these falls. From here a trek about 15-20mins on concrete steps takes one to the waterfalls. The entire path is densely wooded and the Forest department has arranged seating areas from where visitors can relax and enjoy the view of the waterfalls. During summer, the waterfall reduces to a narrow stream and in rainy season, the Irupu falls, flows a stunning sight. But during the rainy season as the way through the lush green vegetation may be slippery and there are bound to be leeches. So it is best to visit these falls just after the monsoon i.e in October. Those who interested in trekking, the trek route (9kms) which leads to the Narimala forest camp and then on to Brahmagiri peak (located at 1608 m height, it is a scenic tourist attraction) is really exhilarating. For this, prior permission is needed from the Brahmagiri Sanctuary Reserve (Contact: Mr.Pramod, Forest Range Office, Srimangala, Mob: 9448813835). The best season for this trekking is between November and February. On the way of this trek, one can spot flora and fauna of Western ghats. The endangered "Malabar Blue Bandit" butterfly is usually seen near the Iruppu falls.